Vapourlites is a popular e-cigarette brand from the UK. You can tell they’re from the UK because of the U in the word vapour, but I digress. Vapourlites e-cigarettes can be found both online and in many stores across the country. The company recently sent me a copy of their disposable and their basic starter kit, so here we have the Vapourlites e-cigarette review. Both the disposable and refillable models I have are to be a little blunt, very typical e-cigarettes. 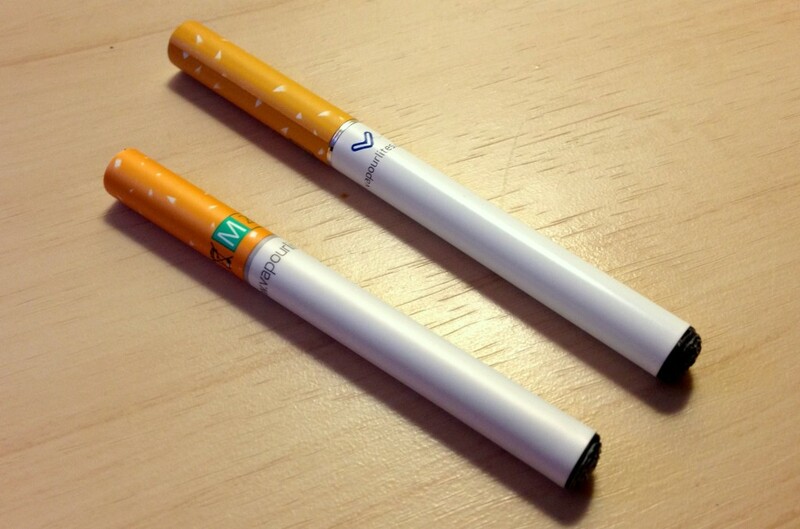 They feature a white battery and a cartridge with the simulated cigarette filter. For those looking for the regular cigarette experience, these definitely do a good job in the lookalike department. The disposable is the better of the two in terms of a traditional cigarette simulation. 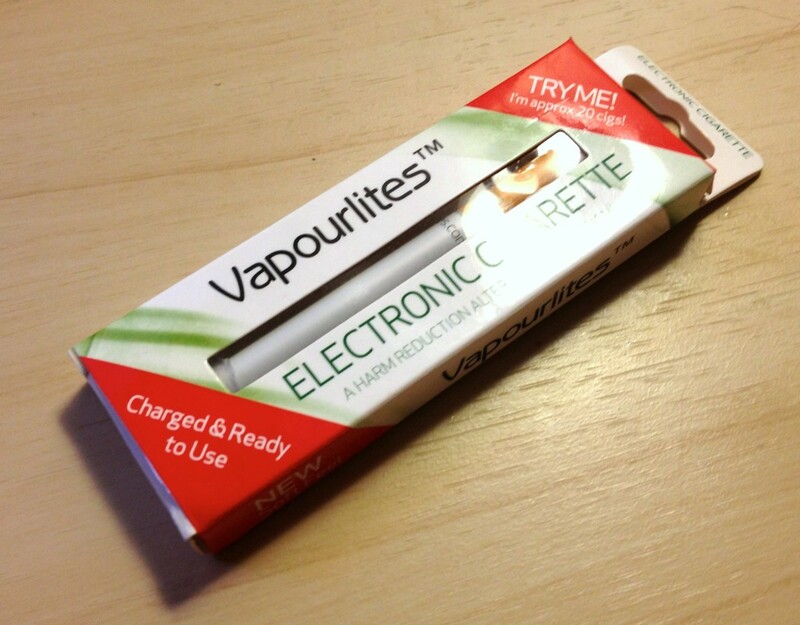 Vapourlites’ disposables are considerable smaller than the rechargeable version. They have a sort of squishy feel to them just like a regular cigarette. Unlike some other disposables I’ve reviewed that feature a soft “filter” even the battery on this one has a slight amount of give to it. I found the disposable to be surprisingly light as well. It was heavier than a regular cigarette, but much lighter than the refillable or other disposables I’ve tried. The rechargeable e-cigarette I got is a sample of their VL4 base kit (visit their site for more options) . In my mind this is more of a sampler than a starter kit as it’s pretty anemic in its offering. It comes with but one single battery and cartomizer as well as a charger. The good news is that it’s a very inexpensive setup at 9.99 GBP so it makes it a good point for the curious about e-cigarettes. Of course if you bought the kit and liked it, you’d probably be better off buying a second, bigger kit to add on to it and just keep this kit as an extra battery and charger. One nice thing about these kits are that they are 510 threaded. I also think that the batteries (available in automatic only) are well constructed. They are plastic, but feel very solid, the finish and logos are silk screened on white plastic instead of being a decal like other standard style e-cigarettes (and Vapourlites’ disposable). This one is a little odd and isn’t a feature, but for some reason I like that they print right on the box “A harm reduction alternative to smoking.” It’s a little thing I know, but I’d like to see more companies take that approach, particularly in the traditional e-cigarette space. While we’re talking about the little things, I’m also happy to note that neither of these models had a red LED at the end. The disposable lit up green while the kit had a blue light at the tip.